3 days off to enjoy some Fun time? I love this card! The little splatters, the depth of the card and the different embellishments are just amazing. Pretty card!! Love the splatters! What a gorgeous card, Theresa! Love the splashes of bright color!! This card is gorgeous!! Love the hot air balloon and the pretty design!!! Awesome card for Valentine's day!!! Have a great day. This is so pretty Theresa! great colors and awesome background - perfect Valentine card! This card is just so bright and fun . Where did you get that huge clothes pin? Very pretty card! Hope you are having a good week. Oh this is gorgeous Theresa!!! I love that bottle cap embellie and love that background! The hot air balloon is so pretty too!! Wonderful design! Absolutely gorgeous card! 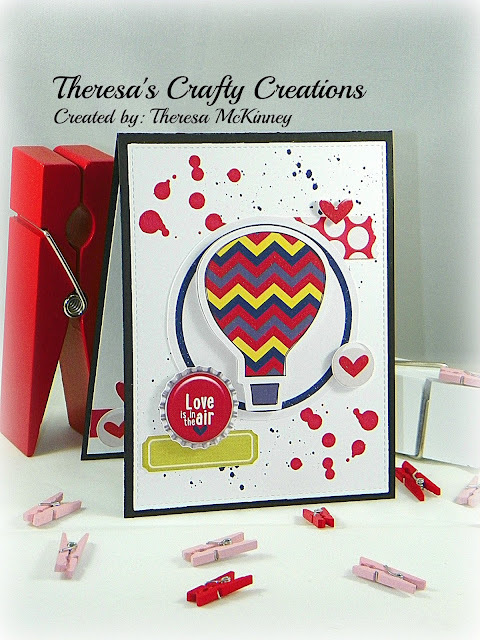 I love the beautiful hot air balloon front and center on your card! The background looks so amazing too! That background is awesome! Did you create it by splattering yourself? Tell me! So glad this turned out just the way you wanted! Gotta love it when that happens! The card looks fantastic to me, too! Love, love, love this! Don't you just love it when a card turns out just the way you envisioned it? It doesn't happen often with me, but it's such a great feeling when it does. I absolutely love this!